Visit McDonald's on Foundry Road, approximately a 3.19 mile driving distance north of the centre of Swansea, in Morriston (not far from Castle Bingo (Se)). This restaurant is an excellent addition to the local businesses of Tregof, Ynystawe, Morriston, Parc Gwernfadog, Cwmrhydyceirw, Parc Bryn Heulog, Brynhyfryd and Winch Wen. Its opening times for today (Thursday) are 24 hours. Please review the specifics on this page for McDonald's Morriston, Swansea, including the opening hours, address description and telephone info. McDonald's is situated in an ideal place immediately near the roundabout of Fendrod Way, Samlet Road, Clase Road and Nantyffin Road, in Morriston, Swansea. Currently located a 1 minute drive time from Green Street, Clase Road, Slate Street or Glantawe Street; a 4 minute drive from Ffordd Cwm Tawe, A48 / Samlet Road or Pentrepoeth Road; or a 9 minute drive time from Nantyffin Road and Junction 45 (Ynysforgan) of M4. Users of Satellite Navigation devices should use the postcode SA6 8DU or navigate button. Please use the bus stops at Capel Seion, Morriston Cross (Sw), Castle Bingo (Se) and Morriston Police Station 1. The nearest accessible services: 4, 31, 36, 4A and 4B. Customers can take the train to Llansamlet Station (1.58 mi away). Getting here is easy via the line: Arriva Trains Wales. In the neighbourhood you can visit Pentre'r Graig Primary School, Morriston Park, Swansea Vale Local Nature Reserve, St Samlet Grave Yard, Saint Samlet's Church and Neath Port Talbot College Craft Training Centre. The total number of McDonald's locations presently operational in Swansea, Dyfed is 8. 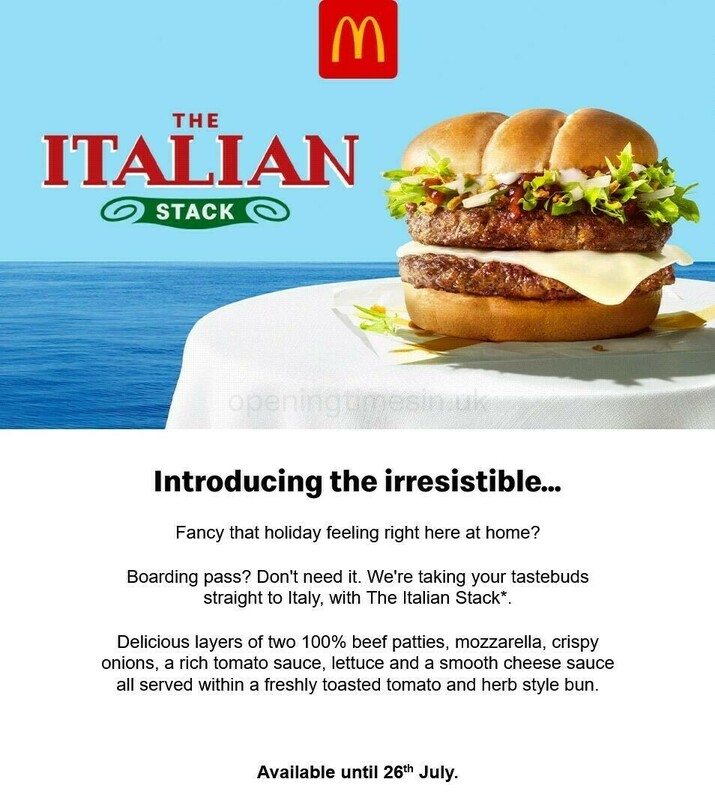 For more McDonald's restaurants near Swansea, go here. During UK national holidays, usual operating times for McDonald's in Morriston, Swansea may be modified. In the year 2019 it pertains to Xmas Day, New Year's, Easter Sunday or Black Friday. It is recommended that you go to the official website or phone the direct service number at 370 524 4622 to get precise details about McDonald's Morriston, Swansea seasonal hours of opening. The Opening Times in the UK team's main objective is to supply you with the most accurate information as possible. Please don’t hesitate to use this form to report any mistakes with the place of business address or open hours for McDonald's in Morriston, Swansea. Please critique McDonald's. Your feedback is welcome! Submit your review in the form provided below.